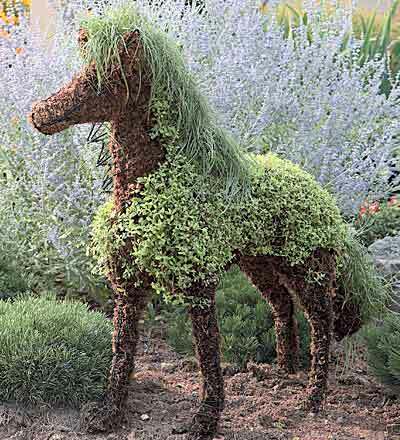 This magical Mossed Horse Topiary will provide a whimsical touch to your garden and be the envy of your gardening friends. This pretty pony stands over three feet high and looks like it could come to life at any moment. This equine wire sculpture comes fully mossed and ready for planting. Plants not included. If a horse isn't quite your style, other topiary shapes are available, including a turtle, a rooster, several dog breeds, and even a sea serpent. For more information or to order, click here. Editor's Update: Unfortunately this moss horse is no longer available. You may be able to find something similar by doing a search for "mossed horse topicary". PatioandYard has some interesting moss animal shaped topiary.